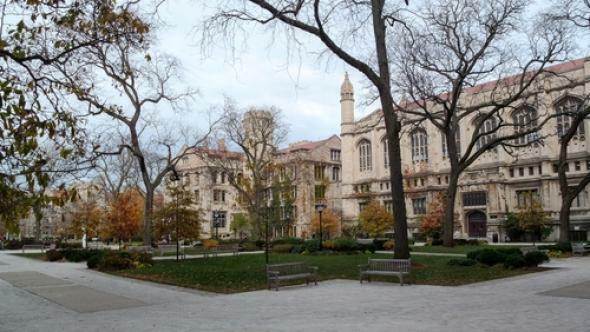 University of Chicago closed over FBI report of gun attack threat. The University of Chicago in Hyde Park. Update, 2:00 p.m.: The University of Illinois at Chicago says in a statement that one of its students has been arrested for the threat against the University of Chicago described below. Per the Chicago Tribune, the threat specifically involved a vow, made in the comment section of the WorldStarHipHop site, to kill white students in retaliation for the 2014 death of Chicago resident Laquan McDonald at the hands of a white police officer. The racial background of the student who was arrested has not been disclosed. A number of students and a professor were shot and killed on Oct. 2 by a student at Umpqua Community College in Oregon; six University of California–Santa Barbara students were killed, three by gunshots, near that school’s campus on May 23, 2014, by a nonstudent attacker. Earlier this month, two college students in Missouri were arrested for making violent threats against University of Missouri students.